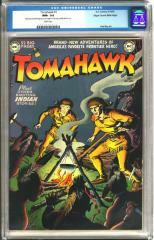 The best comic book collection ever found! Where I have the data I have included the last known sale of the comic but it is very likely that there have been subsequent and higher sales. I will add to this list of some of my favourite covers. 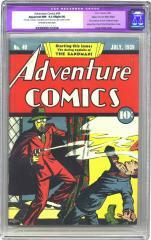 "Also known as "The Mile High Collection," the Edgar Church collection is undoubtedly the finest collection of comic books ever found. 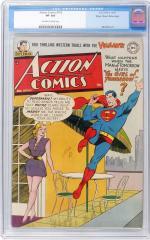 It amazes me that, in a nation of 100 to 200 million persons, 10 billion comics were purchased between 1935 and 1965, and only one such quality collection was accumulated and safely stored! Before we get into the interesting circumstances surrounding these collections, it is important to note that many of those who found these impressive collections are reluctant to reveal the sources or circumstances for personal reasons. 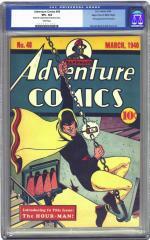 (Perhaps the collector requested anonymity, or perhaps no information was ever even obtained.) Our representations in this chapter are based on the best information we were able to obtain from dozens of interviews and from information circulating between collectors and dealers. 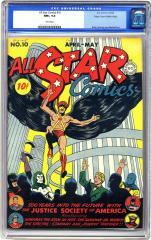 The year was 1977, the place was in the "Mile High Comics" store operated by Chuck Rozanski, Denver, Colorado. 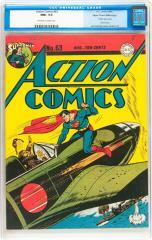 He received a call from someone stating he wanted to sell his large accumulation of comic books. Apparently, he had tried other dealers and none were willing to travel to his home to view the collection. Chuck Rozanski was willing to check it out. 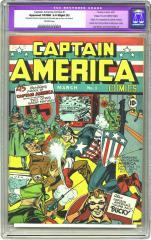 Reportedly, the seller already had a price in mind, $1800 cash, for 18,000 comic books. After some time had elapsed, and with help from Burrell Rowe, Chuck purchased the collection. 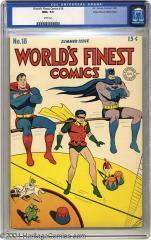 The comics were stored in the basement, which was dry, dark and cooler than the rest of the home. They were located in what appeared to be a large pantry located in the center of the basement. The pantry was approximately 6 ft. by 8 ft. with painted shelves all around the walls. When the Churches opened the door, Chuck was almost floored at the sight of almost a solid wall of comic books stacked to the ceiling. All the shelves were stacked solidly, and there were dozens of neat stacks of comics on the floor. 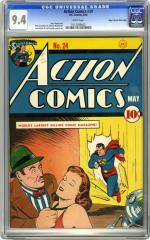 Immediately, he could see that the comic books appeared to have been bought and stacked, without having even been read. Clearly, this would be a good investment of $1800. 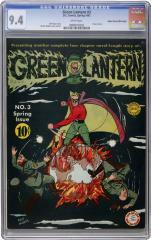 In addition to the comic books, there were at least a couple of pallets filled with cut-up pulps, magazines of all kinds, advertising samples, calendars, artwork by Edgar Church, and other dissected printed matter. Apparently Edgar Church was a commercial artist and purchased all the newsstand materials in order to aid him in his commercial endeavors. Most of his work was for advertising and he appeared to be best at illus-trating with designs and lettering. He seemed to have some difficulty with drawing human figures. It was perhaps his desire to improve his cartooning skill that had prompted the accumulation of all the comic books, for a future time when he could develop that market for his work. Perhaps he was ready to start cutting up the comics as he did with all the other magazines!!! Much of the cut-up pulps and magazines were from the 1920s and 1930s. 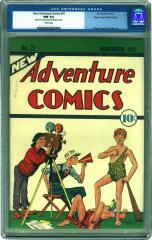 The comics seemed to come later in his already developed career as commercial artist. 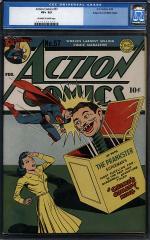 He purchased virtually every "serious" comic book from 1939 to 1953. 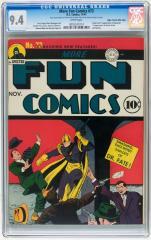 He generally did not purchase the "funny" books, like the Dell Publishing comics, or funny animal character comics. Once he got started buying fresh from his supplier, likely a corner store, he went to a used magazine store, "The Reader's Guild," on 14th Street, Denver. 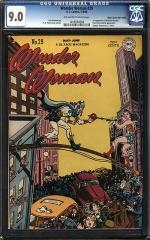 There he could buy once or twice read comics from the previous couple of years for only 5¢ to 8¢ each. These copies were sometimes marked with double pencil slashes in the upper left corner, or by the new price marked in pencil. However, the large majority of his collection was bought from a single source. 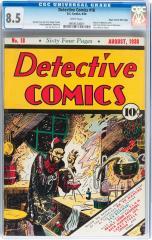 All the distributor markings are similar, generally a "D" with the arrival date on the left of the cover and a number on the right indicating how many comics were stocked by the distributor, usually 4 to 8 (certainly an indication of the popularity of certain comics in Denver at that time). The small, suburban, boxlike, with a brick front porch and stairs leading down to the sidewalk was Edgar Church's home when he collected and stored this fabulous collection. Some of the comics he acquired were subscription copies and thus gave this street address. The details concerning why Edgar Church stopped collecting, why the family sold the collection, or when he passed away are unclear. We intend to respect his personal privacy. While it is known that the last authentic copies from his collection were from 1953/1954, many of the copies from the 1950s do not have identifying marks, and they are not of the same superb quality".